White Robot are an alternative folk duo, consisting of songwriter/guitarist Asher Cochlain and singer Amanda Joy. Intriguingly, despite their artistic collaboration they have never actually met, making it a creative endeavour reflective of the post-Internet era, culturally. Their music is essentially alt. folk/dark folk, first bringing to mind artists like Laura Marling, Gillian Welch, Lisa Hannigan and Ani DeFranco due to Amanda Joy’s crystalline lead vocals, with a Nick Drake influence in the picked acoustic guitar playing and melancholic songwriting style of Asher Cochlain. The Belligerent North Star consists of nine tracks, starting with the folk blues of Dark House. The intricate acoustic guitar work of Cochlain immediately captures the ear, before Amanda Joy’s evocative voice soon weaves its spell on the listener. From its first lines there is a darkly poetic quality to the words that fits the music perfectly: “In this house they decease, they are numb….”. Despite the song’s brevity, the haunting title hook makes an instant impression and sticks fast in the mind: “There’s freedom in the dark house….”. It has an ironic poignancy that made me think of Nick Drake’s Fruit Tree. The second track Clap Hands will be familiar to fans of the Tom Waits album Rain Dogs, though this is not so much a cover version as a complete reinterpretation. Keeping the lyrics and vocal melody the same, Cochlain re-harmonizes the music which breathes new life into the song, along with the very inventive arrangement (including 12 string guitar and piano) and modern production style. Another great vocal from Amanda here. Paranoid Rose is a hymnal, beautiful folk ballad with haunting Fleet Foxes-style stacked vocal harmonies. It creates a dreamlike, mystical ambience with a slightly sinister undertow. This dark but spiritual vibe continues with Broke His Body With A Rope, which features male lead vocals courtesy of Cole Am and features powerful lines: “Broke his bones but they couldn’t break his soul, he knew there was something more in store….”. Banshee and a Farm Boy is a lovely duet, featuring vocals from both Cole and Amanda. Like all the songs, it is exquisitely crafted and arranged with some fine piano work from Bogaert Frederic, which works in perfect tandem with Cochlain’s finger-picked acoustic guitar. The following James is perhaps the most immediate song on the album, starting with a vocal refrain of “James Earl Jones” (perhaps known best as the voice of Darth Vader) then goes into a wild jazz section, the kind of random mid track interlude that made me think of Beck’s Odelay album. Amanda’s vocals are joined by some low-octave male vocals in places, which creates an interesting contrast. Go Go Heartless Horse is a brief instrumental that acts as a fine showcase for Cochlain’s superb guitar playing, and there’s plenty more of that on the last ‘proper’ song on the album, Flame of Grey. It features a particularly enchanting lead vocal, reminiscent of Kate Bush at her most ethereal and otherworldly, and the whole song has a transcendent quality. The final track All Thorns Are Brothers is rather a curveball, twenty seconds of acoustic guitar, electronic noises and vocal samples which gives a satisfyingly unpredictable ending to the album. Overall, this is a highly accomplished work from an inspired artistic collaboration that brings traditional folk into the modern era. The combination of Asher Cochlain’s songwriting and guitar skills with Amanda Joy’s beatific voice makes for many moments of musical beauty. This album stands alongside the best in this genre and deserves to be heard by many. Brandon Wolf Hill is an alternative hip-hop artist and producer hailing from Maple Grove, Minnesota. He began his journey in the music industry in 2016 and has so far released two albums. His debut album Wolf Heart was released that year , followed up with 2017’s Wolf. This prolific artist has also released several singles and EPs, with his Alien EP released this year featuring his most well-known track, Hold Up. Overall, this is a poignant and affecting track from a versatile artist who fuses genres in a fresh and innovative way, similar to an artist like Beck, and it shows he can write from a deep and honest emotional place. This approach is fairly unique in the world of hip hop, and having his own artistic style and sound will help him stand out from the crowd. I expect that more material of this quality will mean he develops a sizeable fanbase and standing in the hip-hop world. Rome Will Burn are an electronic/pop duo hailing from Los Angeles. They consist of vocalist/songwriter Alyssa Suede and DJ/violinist Manifesto. Alyssa is the sister of Beck, and their father David Campbell acts as producer/arranger on this EP. After leaving drama school to pursue music, Alyssa became a guitarist and achieved success as a singer/songwriter, appearing at SXSW and Sundance as well as winning awards for her videos to Falling From Mars and Hollow (3D). Manifesto started out in the classical world, studying violin as a child and gaining international renown performing to audiences around the world. He decided on a different path eventually, becoming a trance/progressive DJ whilst incorporating the electric violin. After becoming popular on the underground scene, he became a producer and collaborated with Seal, Benny Benassi and Paul Van Dyk amongst many others. They formed in 2013 and this EP is their debut release. First track Chameleon is a strong example of their musical style. It’s a mid paced pop/electronica track with Manifesto’s Gypsy violin playing incorporated throughout to give it a unique sonic flavour. This is combined with synths and percussion, handclaps providing a four to the floor pulse which becomes a kick drum on the second verse. Alyssa has a powerful, distinctive voice that is slightly reminiscent of Sia and grabs you immediately. The song is about a two faced character who she finds difficult to resist nonetheless: “Guess I like playing with danger, till you go and change your colours again…”. The verse bursts into an anthemic chorus that lodges in the memory instantly: “You spin me round and I don’t know where to go…”. It works excellently as a commercial pop track for radio and would also go down well in the clubs, as I’m sure was intended. These Three Words is another finely crafted track that uses a similar quiet verse/big chorus structure, though this is more mellow and romantic. It features another superb vocal performance from Alyssa, who shows her large vocal range on the sky-scraping chorus. The lyrical hook is simple effective “I love you, I do…you came into my life as soft as a butterfly…”. It’s such a strong chorus that it is another potential single. Waging Romance starts out in a way similar to Chameleon, with a haunting violin melody interweaving with Alyssa’s vocal. Then the pulsing beat develops into a full dance groove on yet another memorable chorus, which gives the track a big lift. After the second chorus there is a violin solo which provides an unexpected contrast and works well. Rome Will Burn have a real gift for consistently great pop hooks and this is another one. Live By The Beat continues the high quality, and this electro-dance/pop track seems particularly suited to the dancefloor with a pounding kick drum. This is the kind of song Lady Gaga would kill for, and I’d be surprised if these songs aren’t on their debut album, as they are simply too good for just an EP. Body Language is the most musically diverse track here, starting out electro dance with a see-saw synth riff that draws you in, then morphing into a funk guitar section with Alyssa laying down an unpredictable but highly effective vocal melody. Another violin section combined with vocoder and spoken word elements thrown into the mix further add to the heady brew, all held together by the addictive “Work that body language…” chorus hook. This one is a lot to take in on first listen, but acts as a real grower. Overall, this is a fantastic debut release from a pop/dance duo who have carefully cultivated and developed their sound in the studio and are already the ‘finished article’. The combination of Alyssa Suede’s voice and Manifesto’s Gypsy/classical influence makes for a unique sound that will help them stand apart from the crowd. Several of these tracks would make excellent singles, and Alyssa being Beck’s sister will not hurt in terms of publicity! No nepotism is necessary though, Rome Will Burn stand out as a musical force to be reckoned with and you’ll be hearing a lot more from them in the future. 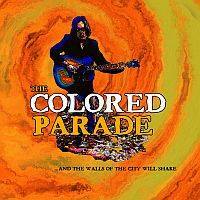 The Colored Parade is essentially the brainchild of singer, songwriter and multi-instrumentalist Andrew Adkins. Having been in the critically eluded Mellow Down Easy and voted one of the top three songwriters in Nashville, this album finds Adkins blending a mélange of musical styles to create something refreshingly unique. It would difficult to pigeonhole the music into any existing genre, it’s a melting pot of country, rock and blues, with shades of gospel, folk and electronica thrown for good measure. And let’s not forget the colourful flourishes of brass and strings. If pressed, I’d call it psych-country, but best the listener decide for themselves. The title, however, is most apt, coming from Plato’s old adage, “When the mode of the music changes, the walls of the city will shake…”. His original twist on country/blues could be compared to Beck’s Odelay though stylistically is much closer to the home-spun authentic charm of The Band (if maybe with a little acid slipped in their tea!). Adkins’ voice is reminiscent of a more guttural and ballsy Marc Bolan, though musically also brings to mind such disparate influences as Steve Earle, 60’s legends Love, Syd Barrett-era Pink Floyd (especially the very trippy finale Out Of The Ether) and the melding of different styles and instrumentation also made me think of Mercury Rev’s seminal Deserters’ Songs. The joy of this album is that you never quite know where things are heading. Opener ‘Please, Be Kind’ wrong foots the listener halfway through via a dreamy pedal-steel section and the album takes many delightful left turns like this. The short-but-sweet second track ‘When The World’s Against Me’ is a nice contrast, which is notable for its mariachi-style brass arrangement. Over the next few songs, Adkins also shows his skill as a lyricist with a deft Dylan-esque turn of phrase and gift for imagery (‘when the stars fall like confetti down the drain’ , ‘like a lightning bolt through a heart of stone’). The gritty ‘I’m Indestructible’ brought to mind the retro-blues of The Black Keys, currently huge, which shows the album has commercial potential. Other highlights for me were ‘Too Much Out of Line’, which features a mellifluous guitar solo, and my personal favourite ‘Let’s Set Fire To This World’, a five-minute long call-to-arms against apathy in the face of worldly corruption. It must be said though that there’s no weak links at all here, and across thirteen songs, that’s quite an achievement.